The Milwaukee County Zoo has acquired three red kangaroos, each 1½ years old, from the Dickerson Park Zoo in Springfield, Missouri. The half sisters named Angel (red ear tag), Anastasia (light blue tag) and Ama (royal blue tag) share the same father but have different mothers. 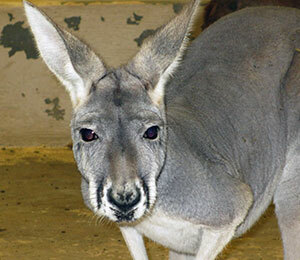 Keepers are hoping for future breeding with our male, 4-year-old Willeroo. Unfortunately, Willeroo was not showing interest in our current older females, Maybelle, Gidget and Ellie May, all age 8. The young red kangaroos are easy to spot on exhibit since their coats are a much lighter color than the older kangaroos. 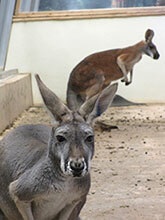 See all of the red kangaroos in the Australia Building or in their outdoor yard. Females can nurture multiple joeys (baby kangaroo) at the same time including one in their uterus, one in their pouch and another one nursing outside of the pouch.